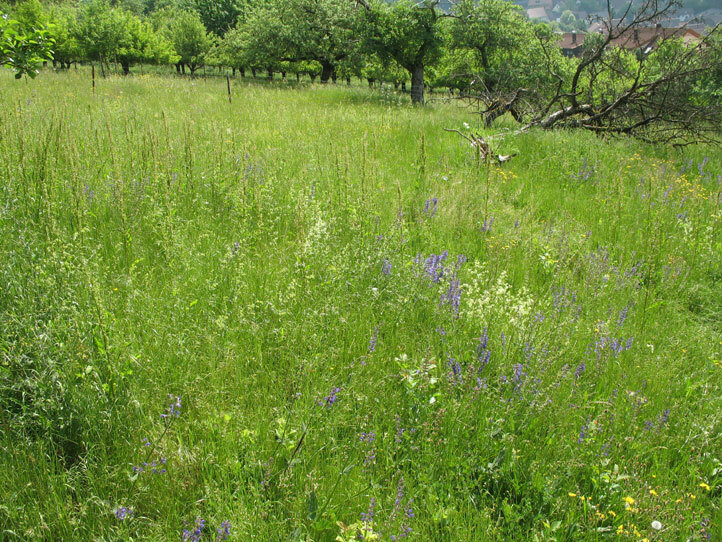 The so far treated habitats make up a large part of the significant natural habitats in central Europe. But there are also other, some anthropogenic habitats, which are briefly discussed. Inland dunes, cliffs and quarries may bear also mostly nutrient-poor grassland plant communities, but these are often more extreme (microclimate, gappy places!). Under these special sites also the farmland in the narrow sense is included. 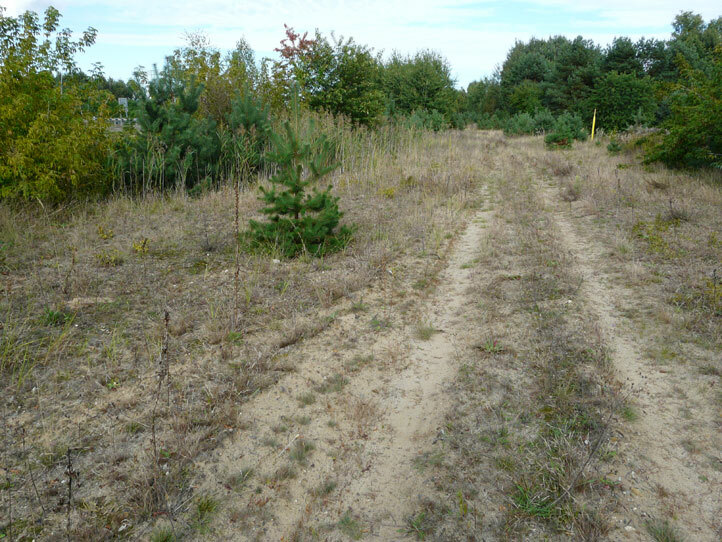 Extensive sand dunes and related grasslands are often found near the coasts, but occasionally - here often small-scale - also in the interior, especially if the otherwise covering climax vegetation (pine, oak / birch forest) has been pushed back through various usages. 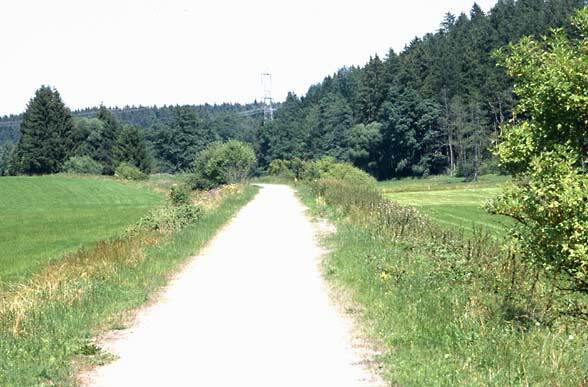 One example are military training grounds as in eastern Germany, which have been kept open by the use. By abandonment, conversion into specialty crops (e.g. asparagus), overbuilding, afforestation etc. 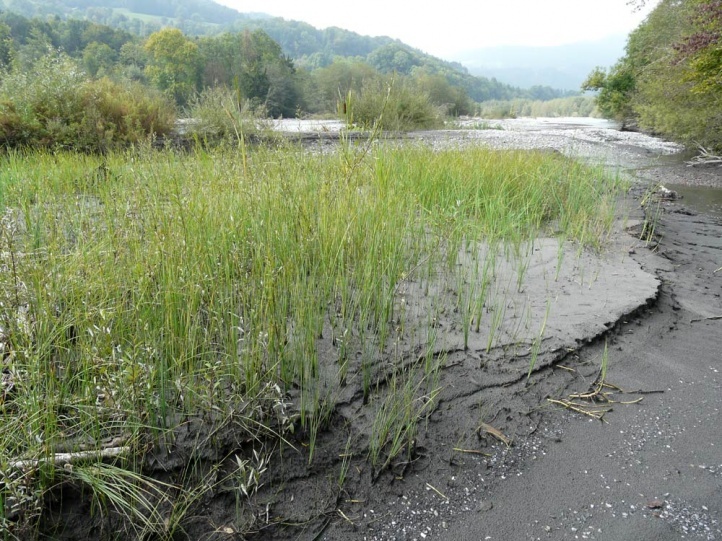 they have declined dramatically in many places, such as in northern Baden in the upper Rhine Valley. Larger sand areas with different stages of grasslands and sparse forests are often surprisingly diverse. Apart from bees, wasps, ants or Neuroptera there occur numerous butterflies, moths and grasshoppers, e.g. Myrmeleotettix maculatus, Oedipoda caerulescens, Sphingonotus caerulans, Hipparchia semele, H. statilinus, H. alcyone, Coscinia cribraria, Staurophora celsia, Calamia tridens etc. The reasons are the low vegetation cover and the xerothermic microclimate. Sand dunes and sandy grasslands are important conservation targets and in need of care and development. This formerly for example in southern Germany quite widespread habitat type (rivers from the Alps as upper Rhine, Iller, Isar, Lech, Inn, etc.) has been virtually eradicated by river engineering of all kinds for flood control, land reclamation, navigation and power generation. 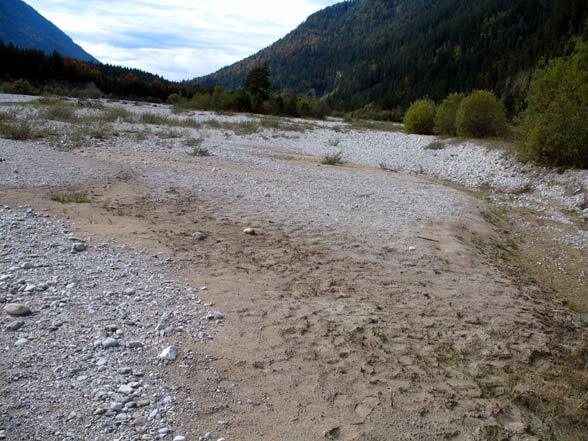 The last remnant is found in Germany at the uppermost Isar valley above the so-called Sylvensteinspeicher (a reservoir). In wild river landscapes there is a mosaic of dry pine woodland fragments with gravel bars of different succession status with Myricaria germanica, willows (Salix eleagnos etc. ), highly specialized grasshoppers (Chortippus pullus, Bryodemella tuberculata, partly Tetrix tuerki) and dry, nutrient-poor grassland stages. Hydroelectric power may be low CO2, ecologically it is not to be recommended in most cases! Rocky slopes are home to a wealth of specialized plant and animal species. Particularly important is the xerotherm microclimate and the only sparse vegetation. 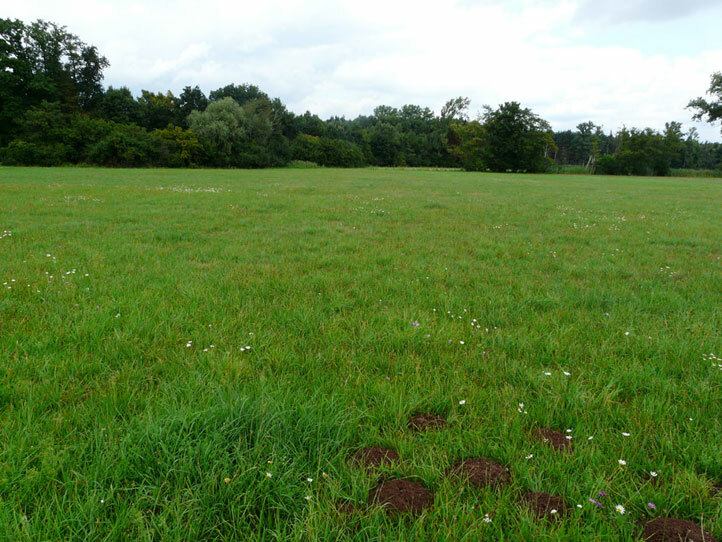 In grasslands without rocks a similar condition can be maintained only by regular disturbance, ie quite intensive grazing! Whith rocks tanning (sun exposure) is crucial. Shadowy cliffs accommodate even a specialized, unique inventory of species, but on sunny rocks you will find significantly more and more spectacular species. 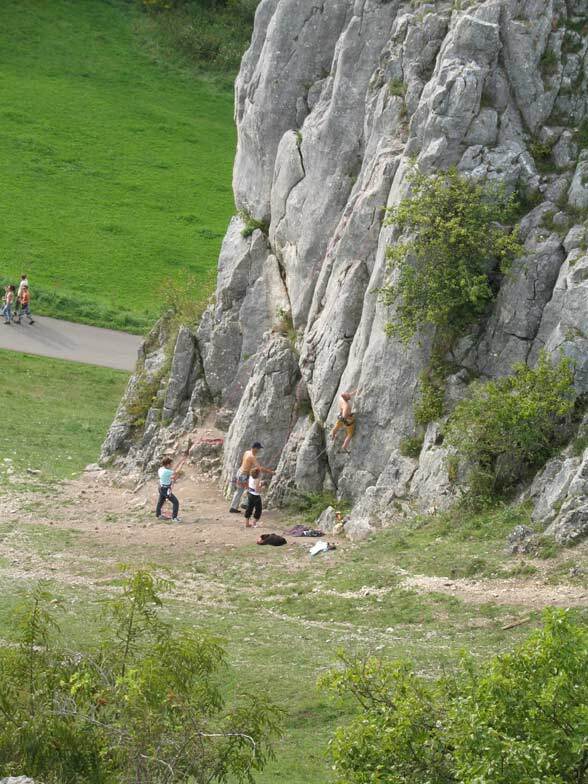 Rocky habitats are threatened by succession (trees around the rock, bushes), high growth of surrounding forests and subsequent shading, some also by overbuilding or road construction as well as by excessive recreational sports (climbing!). In particular due to the former points the Apollo butterfly got almost extinct in non-Alpine central Europe. 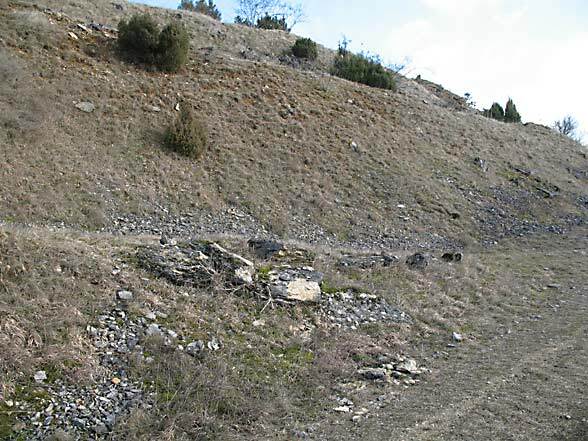 Quarries often have heavily exposed slopes and shallow slopes and mining floors, which favors the formation of sparse and gappy xerothermic grasslands in all stages. Here species with extreme claims, such as Spiris striata, Hyphoraia aulica, Satyrium acaciae and others can also survive. Representatives of other groups are well represented, too. For example, the screw Trochoidea geyeri is a typical inhabitant of rocky slopes and sparse mining floors in quarries. On less extreme parts you can also find normal grasslands species. This interlocking of habitats leads to the high number of species. 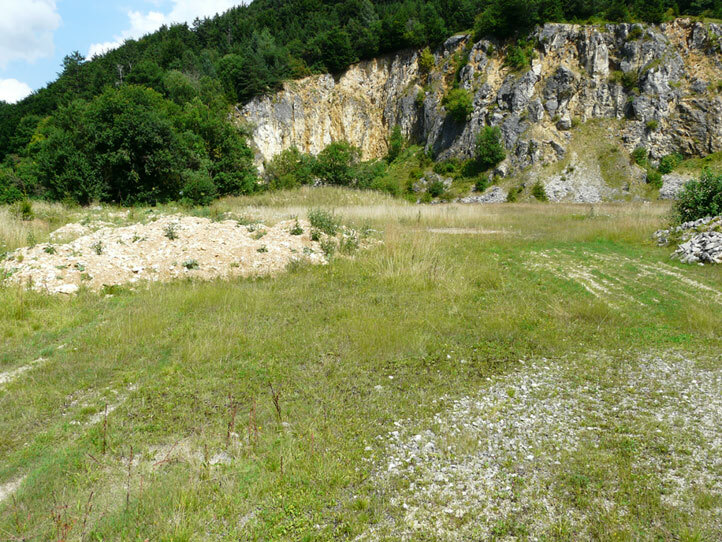 So I counted over 60 species of butterflies and additionally numerous moths in an old, traditional Jura quarry with surrounding nutrienr-poor grasslands on the eastern Swabian Alb (southern Germany)! 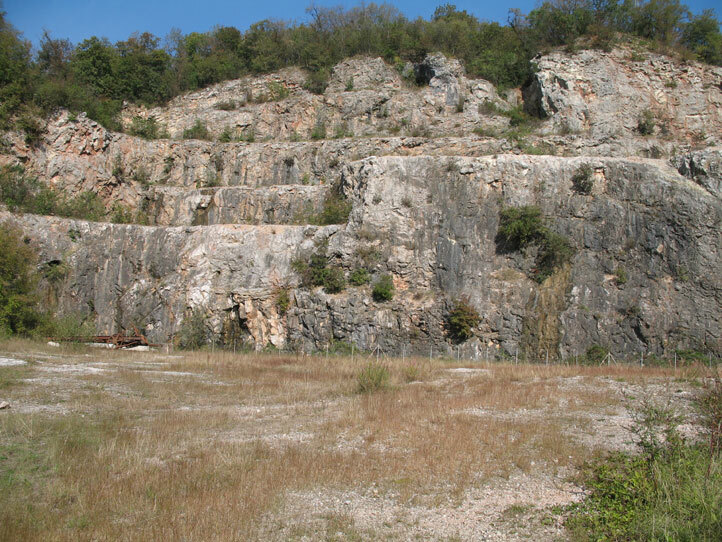 In context with species protection especially old and small-scale quarries are important and only to a somewhat lesser extent large, modern quarries. 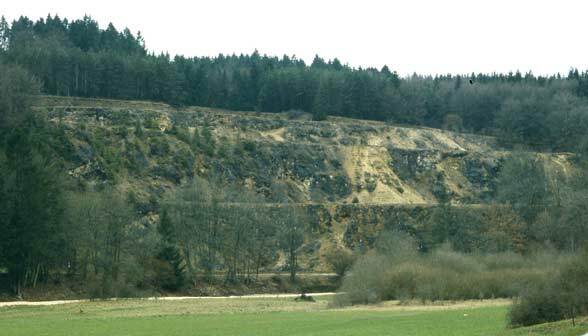 Quarries are endangered through the succession (reforestation) and by the reclamation for agricultural or forestry purposes. In the latter reclamation mines/quarries are filled with nutrient-rich topsoil. Thus, the chance senselessly wasted to obtain and preserve increasingly rare habitats. 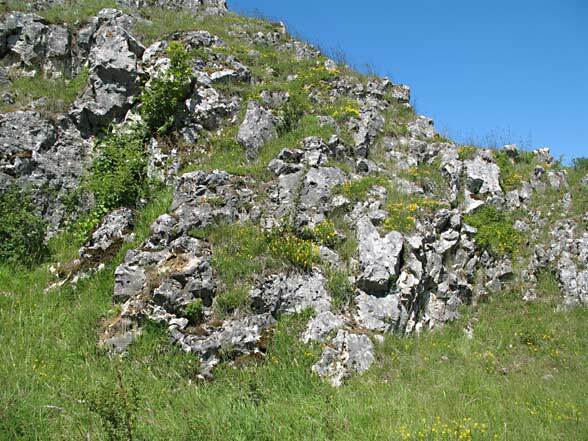 Fields are mostly only of greater importance if they are managed very extensively (eg stony calcareous fields with fallow periods). At least in Central Europe, is hardly occurring any more. Intensive agricultural areas, however, are inhabited only by a few species. 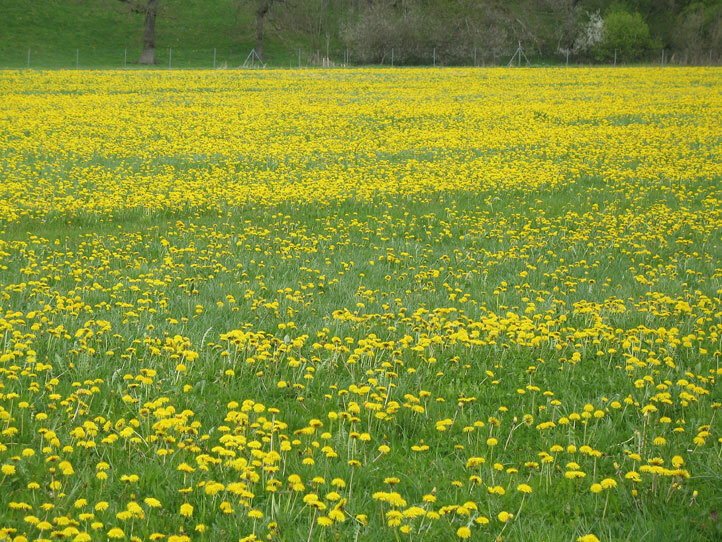 Field margins offer a habitat to species like Aphantopus hyperanthus or Thymelicus lineola. On creeping thistle (Cirsium arvense) caterpillars of the Painted Lady are found and at Nettle herds those of Nymphalis io, N. urticae and V. atalanta. On Convolvulus species at the edge of corn fields, etc. you may observe larvae of Agrius convolvuli in July/August and in potatao fields those of Acherontia atropos. If even the field margins lack (which can be observed more and more often) even the ubiquists disappear. A nowerdays mostly missing former character species of extensive agricultural areas with large margin habitats is the grasshopper Chorthippus apricarius. 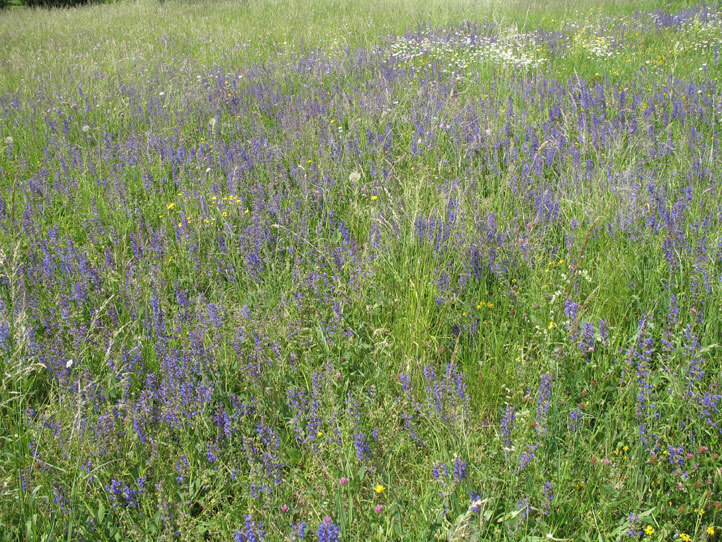 In more extensive forms certainly very important, today, the multi-cut and manure meadows which cover large areas, however, are in general not even home for a single butterfly species and only for very few grasshoppers (Chorthippus parallelus, C. albomarginatus) and moths (Autographa gamma, Hepialus humuli etc.). Exceptions only occur in hot, dry years in Central Europe, as in 2003. 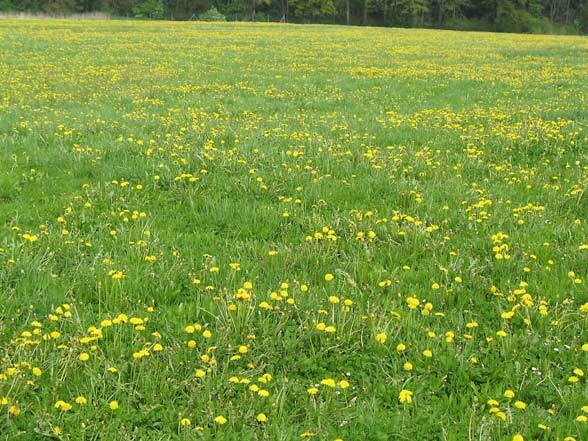 By smaller growth, lower cutting intensity and warmer microclimate (faster development) for example Polyommatus icarus and Colias hyale (both often feeding on white clover) could spread into intensive meadows (e.g. near Memmingen in southern Germany). In places, the same happened with P. semiargus, which had 2003 three generations in southern Germany. But with intensive use in the following year and damp weather these stocks immediately broke together. 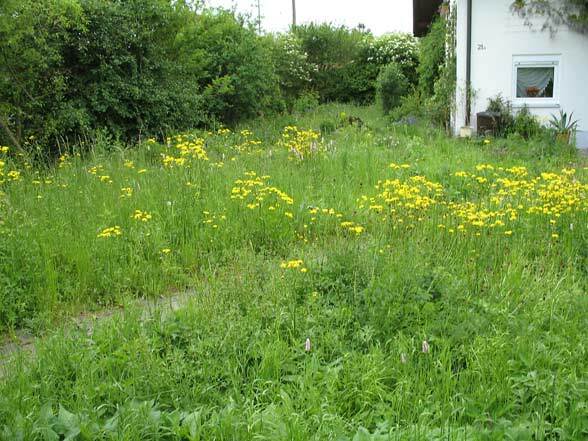 Broad roadsides and railway embankments can be a substitute habitat for extensive meadows. So the chess board (Melanargia galathea) or Erebia medusa can often live along roads with wide margins even while they already almost have disappeared in there primary biotopes in the area. If embankments are created without fat topsoil, there even can develop species-rich habitats with Zygaena ephialtes etc. Unfortunately, almost all embankments are planted with shrubs and trees and are thus worthless for open land species. Only tree species and some moth species like Notodontidae can occur there. But a lot of road salt and high traffic make it difficult to survive even for those species. The few roadsides that are not planted with shrubs are often cut during the flight time of the related butterflies (June/July). It would be very useful if at least 50% of roadside strips (especially those on sunny, nutrient-poor soil) would not be planted with trees and mowed only once in August/September! ... Are usually pretty worthless for the local flora and fauna, but at least for endangered species. Only a few groups such as tree and bush inhabitants are better represented. 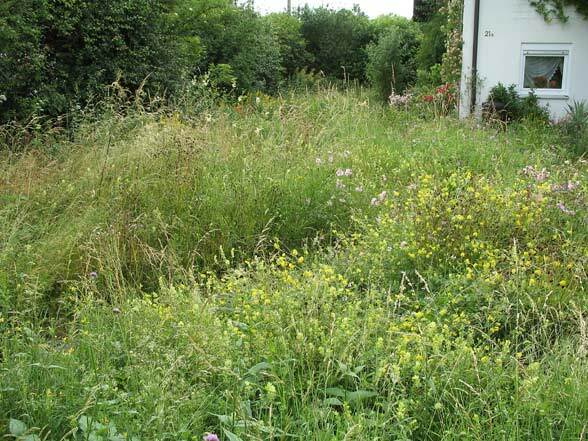 Even natural gardens are rarely home to really endangered species! But on the other hand they indeed play a role in reducing the decline rate of so-called common and widespread species and serve pedagogical purposes. 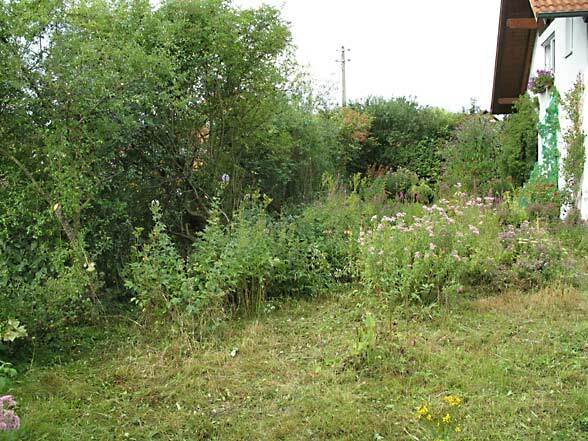 In the illustrated garden, which consists of a small pond, a once in August mowed meadow and a hedge of native species, there live species like Polyommatus icarus, Aphantopus hyperanthus, Ochlodes venatus, Thymelicus sylvestris, T. lineola, Chorthippus dorsatus, Gomphocerippus rufus etc. On Aconitum you find regularly caterpillars of Polychrysia moneta (occurs in the nearby area of the river Iller). Noteworthy are also many wild bees, including Megachile ericetorum and Anthidium oblongatum. In some years there are also larvae of Papilio machaon and various sphingids (Deilephila elpenor, D. porcellus, Smerinthus ocellata, Mimas tiliae, Laothoe populi, Macroglossum stellatarum). 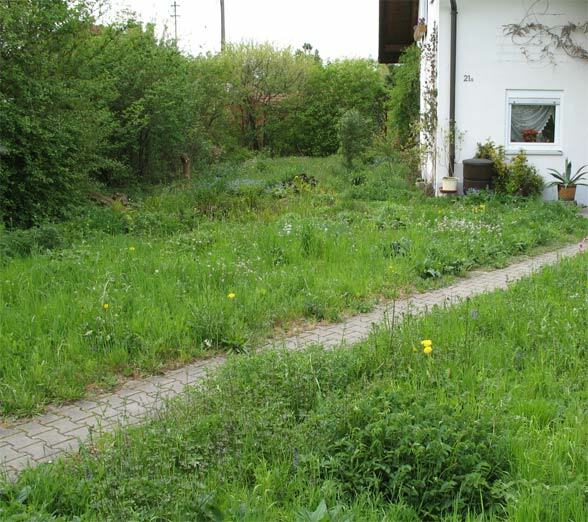 Intensive gardens with a weekly mown lawn and Thuja hedge, however, are completely worthless in ecological context!